I was really, really into Barbies when I was little. I would spend hours playing contentedly in my room, so imagine how bummed I was when my 5-year-old daughter didn’t get the same glee from the dolls. Instead, she was focused solely on drawing and creating detailed visual stories. She was practically a Master’s level crayon artist. But as time goes on, and she approaches 6, her love of art and storytelling have collided with a budding interest in Barbie. Woohoo, she’s finally on board with me and Team Barbie! She even saved up some money to buy her own doll, since my hand-me-down dolls from the ‘80s had seen better days. 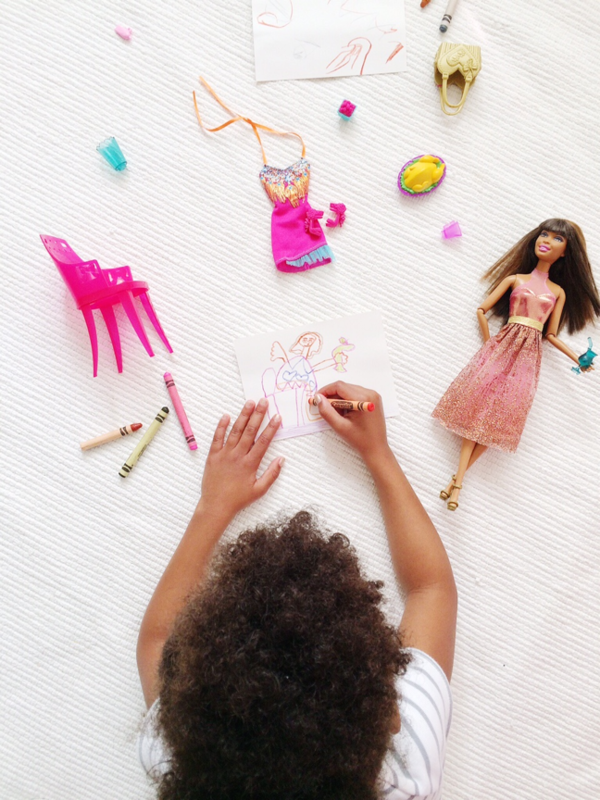 But, simply having her dolls talk to each other quickly became mundane, so she began conceptualizing plot lines, illustrating storyboards, and acting out her ideas with her dolls. 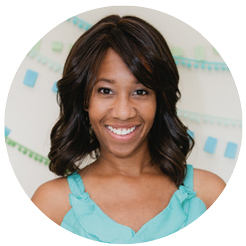 She’s juggling so many moviemaking tasks that she’s like a tiny Tyler Perry. 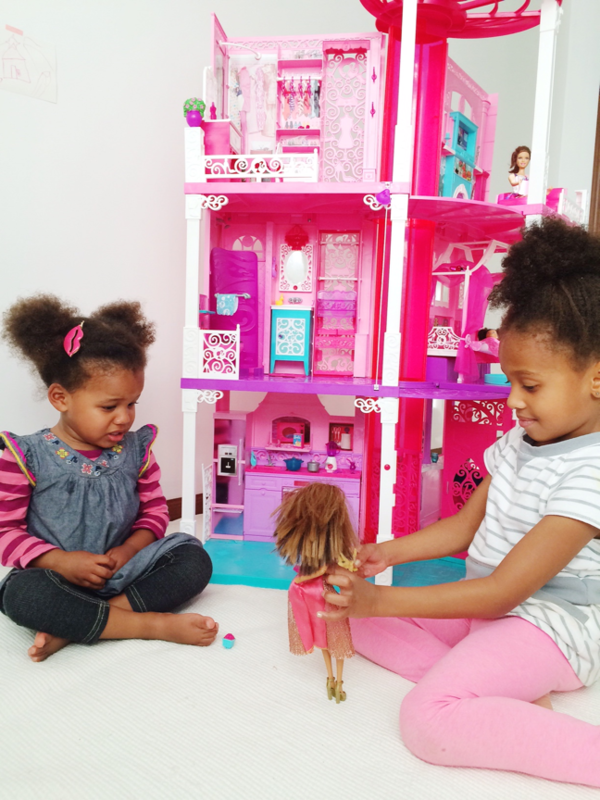 She came up with so many ideas, but her collection of just dolls was limiting her experience. I decided, she could use a few props and playthings to really bring her movie dreams to life. 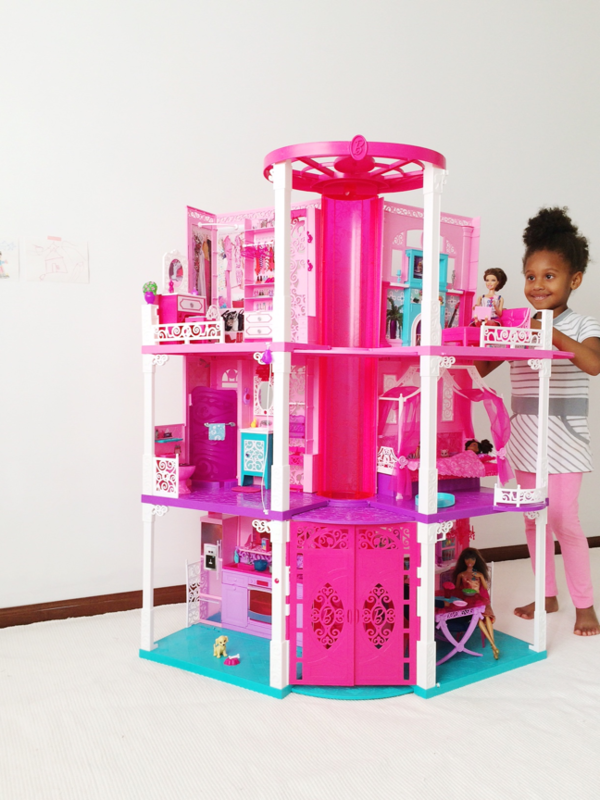 Barbie Dreamhouse to the rescue! I’d assembled the entire thing during her little sister’s nap, so the big surprise was ready when she got home. When she saw all that pink wonderfulness, she squealed, “It’s huuuuuge!” And, she was right. This house is the most detailed toy I’ve ever seen. After she doodles each little detail, she hangs the images on the wall in chronological order, just as they will happen during her feature film. 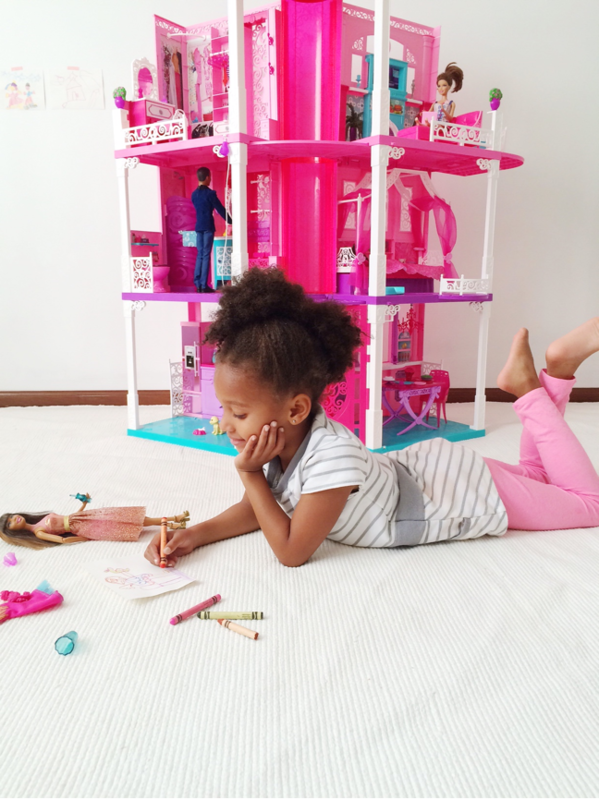 There’s no limit to her imagination, and now, her Barbies have the tools to reenact her storyboards in every way. Recent storyboards have included her doll working on her laptop, while hanging out on the couch and watching TV. I wonder where she got that idea from (as I write this from my couch, while watching TV). 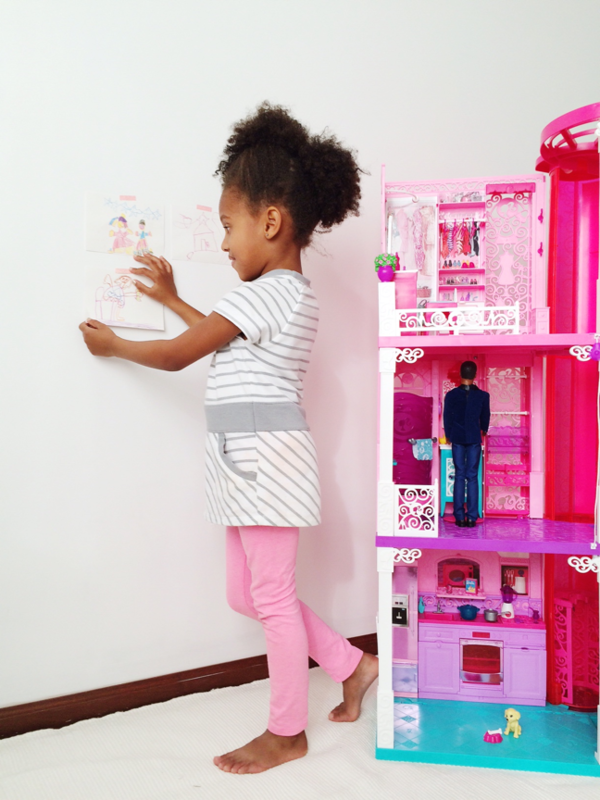 She’s also tackled the gritty topics of potty training in the little bathroom (The toilet even flushes!) and making Thanksgiving dinner (Hello, tiny turkey, oven, and dishwasher!). Her latest movie centers on her doll’s trip to a cafe for a smoothie, which is easy for the cafe staff to whip up in the Dreamhouse’s blender that makes realistic sounds. Remember those detailed drawings I mentioned? She even sketches the chairs the on her little movie set, the smoothies and other props, and the wardrobe she plans to use. She’s not messing around with this writing, directing, acting thing. She’s creating plots and characters, translating them to paper, and bringing them to life with a little playful input from her sister. 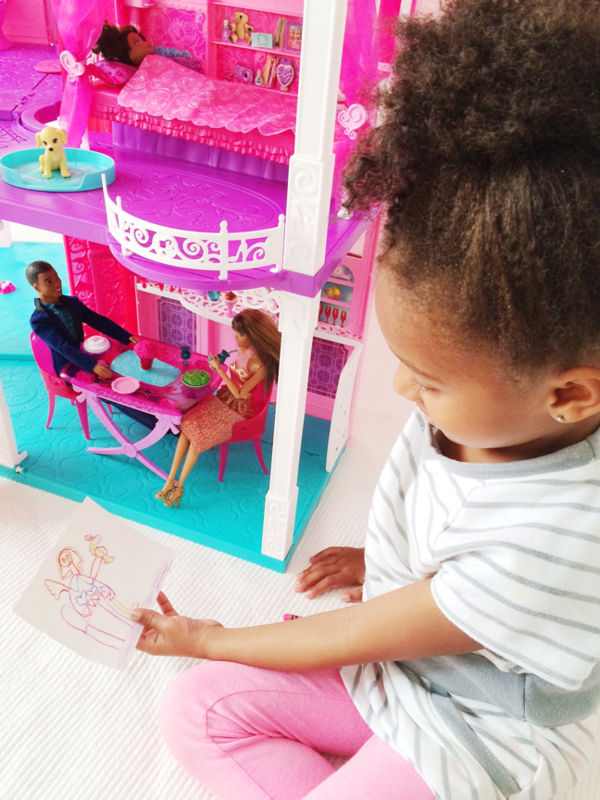 Together, they’re designing this magical, imaginary world, and it reminds me of the hours I used to spend doing exactly the same thing with my Barbies (and one oddly-tall Gem doll). She thinks of it as play, but I know it’s so much more.